This temple adjoining the palace of the former rulers of Manipur, is a historic centre for Vaisnavites. 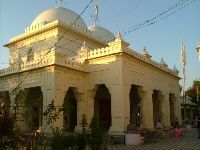 It is a simple and beautiful structure with gold domes, a paved court and a large, raised congregation hall. The presiding deity in the centre is flanked by idols of Radha Govinda, Balaram and Krishna on one side and Jagannath, Balabhadra and Subhadra on the other. 53 kms. from Imphal and on the fringes of Loktak Lake, this is the last natural habitat of the endangered marsh-dwelling brow-antlered deer of Manipur called "Sangai". The scientific name of this deer is "Cervus eldi eldi". The uniqueness of this particular park is that it is the only floating national park in the world and the deer is also found nowhere else on earth. The park is composed of large masses of floating weed (called "Phumdi" in local dialect). Geographically the floating biomass (phumdi) encompasses an area of about 42 sq. km.The thickness of the biomass is from 0.5 to 1.5 metres. These phumdi unseemingly can suport a lot of weight. In fact, migratory fishermen bulid houses on these floating islands of weed that float around the lake. I myself have visited some of these houses (huts, to be more precise). It was quite an experience, really. Imagine going to sleep at night in one part of the lake and waking up the next morning in a different part of the lake!